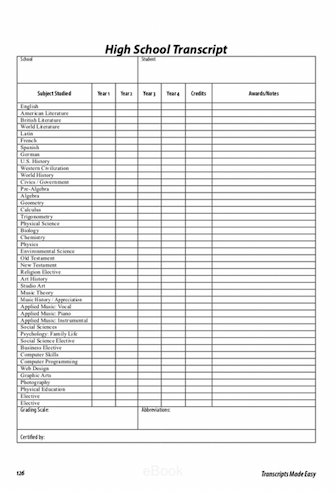 High school record keeping can be a daunting task to tackle, especially transcripts; however, I recently had the opportunity review Transcripts Made Easy: The Homeschooler’s Guide to High-School Paperwork from Everyday Education which is making this task MUCH EASIER! We received the digital version of Transcripts Made Easy: The Homeschooler’s Guide to High-School Paperwork to review and boy am I happy that this resource was introduced to me. WHAT IS TRANSCRIPTS MADE EASY? As long as I have been homeschooling, one of the most common things I hear from those that do not homeschool or are considering homeschooling is — how about high school? How are you going to do that? How do you get them a transcript and diploma for college? Good questions, right? Transcripts made easy answers a TON of these questions. This book is great. I mean, seriously, one of the best resources for homeschooling I have read. 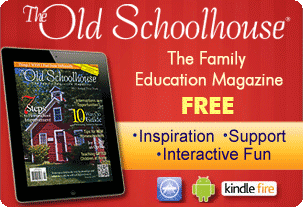 Whether you are new to homeschooling or planning to homeschool through high school, this e-book is JAM-PACKED FULL of information. Honestly, I wish I had found it years ago. This is the 4th edition of Transcriptions Made Easy. First published in 2001, Transcripts Made Easy has sold thousands of copies around the world. Written by Janice Campbell, who wrote it because, after creating her oldest son’s transcript, she found the process so cumbersome, she didn’t want to have to think it all through again. With each addition, she has added new and updated materials, interviewing admissions counselors from different types of colleges and added more information about transcript formats. 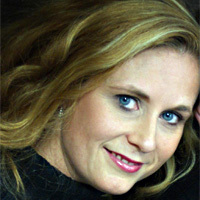 Drawing from her own experience as a college admissions counselor, she has developed a great go-to for any homeschooler with students in or going into high school to help track classes, plan for college or other jobs after college, and how to give a diploma, among several other topics explored in the book. The 4th edition includes a guest chapter from Professor Carol Reynolds on what college freshman need to know in order to succeed during their freshman year in college. This chapter is an excellent read for parents and students alike. There is even a free GPA calculators website resource included to help parents quickly and easily figure a grade point average for the students transcript. Another great thing about Transcripts Made Easy is that the e-book has a TON of examples. I love examples. 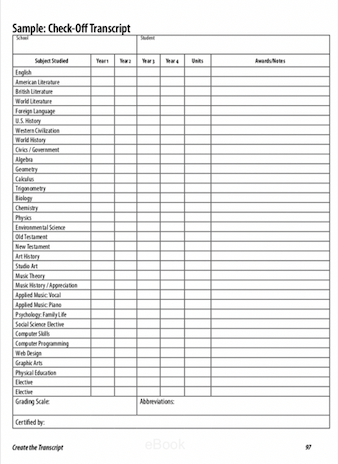 There are sample schedules, transcript examples, diploma samples and even blank reproducible forms for transcripts and diplomas. This really makes understanding and seeing how you can put your own together easy. Preparing for high school can be scary. Not just for the student but for the parent. You have a lot resting on your planning, scheduling, and tracking as a parent. And then you need to make sure that you are giving them the diploma and transcript they need to move on toward whatever plans they have for after college. 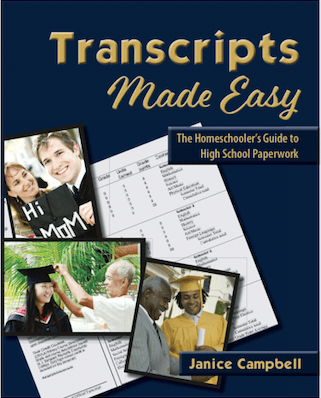 Transcripts Made Easy: The Homeschooler’s Guide to High-School Paperwork also addresses all the other alternatives for after high school This isn’t just for college-bound students but for every student. You never know when your student’s plans will change and ensuring you have everything recorded and ready for whatever path they chose is important. This book can help you feel prepared and rest easy that you are doing what you need to have all your bases covered. I loved that the book had a sample 4 year schedule, the tips for the student preparing for college, different types of transcript formats, and ideas for AP classes, super-senior years, and additional extracurriculars to prepare your student for whatever they have planned. We got some great ideas for high school and I am SO GLAD that I had the opportunity to read this book this year since we begin homeschooling our first high schooler next year. It was PERFECT TIMING to read this book and I couldn’t be happier. Even if you are not sure if you plan to homeschool through high school, this book will help you plan, ensure your student is on the right path, and give you ideas on how to enrich your student’s high school experience. I’m telling you, THIS BOOK IS FOR EVERYONE! Be sure to check out Everyday Education on social media. See what the rest of the Homeschool Review Crew had to say about Transcripts Made Easy: The Homeschooler’s Guide to High-School Paperwork from Everyday Education by clicking the banner below.